The new BMW 2 Series Active Tourer is the ideal if you want something just as capable as mainstream mini-MPVs, but which has added badge appeal, an upmarket interior, as well as more class, glamour and power. There’s no denying that the strengths of the 2 Series Active Tourer are what people generally want from a car like this: Comfort, frugal engines and a top-notch interior that offers lots of space. The thing some buyers might need to wrestle with the most is the price tag. OSV takes a closer look at what it’s all about with our 2018 BMW 2 Series Active Tourer review. BMW just can’t help themselves. Not all buyers will prioritise an entertaining driving experience, but BMW is a brand that is compelled to put together cars that handle better than most. That said, their cars usually rely on a rear-wheel-drive layout for an excellent driving experience. The 2 Series Active Tourer, however, is actually the first ever BMW to get a front-wheel-drive layout. The brand has fine-tuned the new layout so that the 2 Series still drives very much like a BMW. It’s agile in bends and feels nimble in the city. If you happen to be on the hunt for a mini MPV that feels sporty to drive, this one definitely warrants a test drive. It’s no 2 Series Coupe, but it’s more than a match for anything else in this sector. In terms of its engines, a turbocharged 1.5-litre petrol unit kicks things off. It powers the 218i model and can cover the 0-62 dash in 9.2 seconds, which doesn’t seem bad at all when you consider how big this car is. It’s a quiet, smooth engine that emits a roar which suits the nature of the vehicle. A 2.0-litre four-pot petrol engine powers the 220i and 225i models. If you stick to the smaller of the two, you can get from rest to 62mph in 7.5 seconds, while the 225i model covers the same difference in 6.3 seconds. It’s worth pointing out that this is a xDrive model, which means it benefits from four-wheel-drive. The amount of grip on offer is very satisfying but it does mean that fuel costs will rise. One of the reasons buyers will be looking at this instead of its less expensive mainstream rivals is that the BMW promises to be more upmarket. As such, its interior has to impress – and it does. Indeed, its cabin is so premium that it’s head and shoulders above its rivals. Its luxurious and there are plenty of high-quality materials on show. Add to this an excellent driving experience and lots of comfort, and you’re onto a winner if you can afford it. Moreover, the petrols offer a very hushed driving experience and refinement is fantastic. The dashboard is glamorous for what is essentially a mini MPV. It’s finished with some robust materials that look like they’ll last, and if you pay extra for top-spec models you’ll also be able to enjoy some wood effect. The controls are easy to find and use, too. Is the BMW 2 Series Active Tourer practical? It’s not quite as usable as some mainstream, cheaper rivals, with its boot measuring 468-litres. In isolation, that’s not bad at all, but there are competitors that can offer larger boots. Fold the rear seats and you can extend it to 1,510-litres, while a moveable boot floor can extend it a tad more. What does help to set the BMW apart from mainstream rivals is a power-operated boot lid. This will make your life so much easier. Apart from that, a conventional rear bench means you can only fit two child seats as opposed to three, but rear headroom is good. There are plenty of storage spaces here and there, but if you need more space – and we expect some buyers will – it’s worth checking out the Grand Tourer. The purchase price is undoubtedly high, but fortunately BMW has added lots of standard kit. All models come with alloys, a digital radio, separate climate controls for passenger and the driver, as well as sat-nav and the ability to sync it up to a smartphone app that allows you to check all kinds of useful information, such as your current location and how much fuel you’ve got left. The Sport model adds sports seats, the Luxury model gets unique alloys and unique interior details, while the M Sport rounds things off with racier detailing, bigger alloys, lower suspension and a sports body kit. In terms of how safe the car is, it was awarded all five stars by Euro NCAP for its crash test performance back in 2014. Its standard safety kit includes a city-braking function and pedestrian warning, as well as Alertness Assistant and Multi-Collision Braking. Prices for the new car start out from £24,905 and rise to £34,885. For more information on our leasing deals, check out our page here. In terms of its running costs, the petrols won’t be as cheap to run as the diesels, but they benefit from turbochargers, which helps to keep costs down. The 218i petrol model is the most frugal, with returns of 55.4mpg. Emissions, meanwhile, stand at 118g/km of CO2. The 220i model is good for 47.9mpg, while the xDrive four-wheel-drive 225i model returns 44.1mpg at best. All models cost £140 a year to tax, while insurance groups range from 11 to 23. 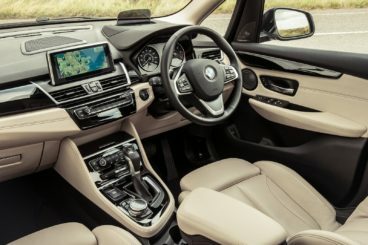 BMW never used to do interiors this good, but they’ve cleaned up their act and eliminated the hard plastics that blighted the Active Tourer’s predecessors cabin. The engines are efficient and economical for this class. The sheer strength of the car provides a reassuring amount of security and boosts its safety credentials. It’s entertaining enough in this class but there is more fun BMW’s out there. This could be a major caveat for some of you. Let’s see how the car fares against its rivals in the comparison section of our 2018 BMW 2 Series Active Tourer review. 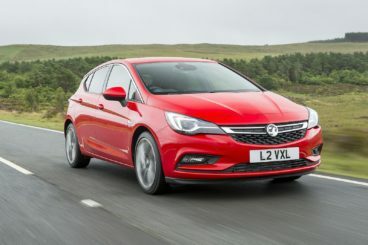 The new Vauxhall Astra has always been a popular choice, and in 2018 it’s better than ever: Its engines are strong and frugal, it boasts lots of new tech and it’s good to drive. Indeed, its on-the-road credentials are one of its biggest strengths. Although the smallest engine will struggle, there’s a lot of other solid units to consider. The car is a lot lighter than last time, which means handling and acceleration are better. Ride quality and grip is also good, while the steering is precise and light. In terms of the petrol engines, there are five to pick from. As we said, the 1.4-litre 98bhp unit is worth overlooking but a 1.0-litre turbo develops 104bhp and is a good choice. It does 0-62 in 10.5 seconds and boasts decent running costs and a relaxed experience. A 1.4-litre turbo engine sits in the middle of the range with its 123bhp, while a 148bhp variant of the same engine is also well worth a look. If, however, you want as much performance from an Astra as possible, a 1.6-litre engine squeezes out 197bhp and has a 0-62 time of 6.6 seconds. Running costs? The 1.0-litre turbo is the most frugal petrol engine, with its returns of 64.2mpg. The turbocharged 1.4-litre engine manages 51.4mpg while emitting 128g/km of CO2, and the range-topping 1.6-litre unit is good for 46.3mpg at best. Inside, the Astra is stylish enough to be able to rival the BMW. It looks better than ever and Vauxhall has splashed out on a copious amount of soft-touch plastics that make it feel high quality. A big touchscreen dominates the dashboard and it gets Apple CarPlay compatibility as standard. Bright chrome-effect and piano-black trims surround it, and the infotainment system does a good job of freeing the dashboard of button clutter. Is the Vauxhall Astra practical? Buyers have always appreciated its usability and once again it’s pretty accommodating. Five adults could squeeze in but four will be much more comfortable and rear space is good. In fact, there’s now 35mm extra knee room than last time. Headroom is also good, as is rear-seat access, while the usual storage spaces are present and correct. The boot, meanwhile, is the same size as last time and measures 370-litres. The new Citroen DS4 Hatchback has a lot to do if it’s to nudge the BMW off the top of your shortlist, but it’s cheaper and looks and feels every inch the premium car. However, it’s miles off the BMW when it comes to driving fun. It uses the same underpinnings as the standard C4 but has been set up to offer a sportier experience. As such, its suspension is stiffer and there’s less body lean in bends. It also feels quite agile. Its steering is fast and fairly weighty but there isn’t enough communication. As a result, it just isn’t as fun as a lot of its rivals. Some buyers will be tempted to specify the automatic ‘box, but as it’s more expensive than the manual and doesn’t improve performance, we’d suggest overlooking it. In terms of the engines, a brand new 1.2-litre PureTech 130 engine brings a lot more to the table than the 1.6-litre unit it’s replaced. It produces more shove, feels relaxed and doesn’t require a lot of effort from you. It’s also refined but its 0-62 time of 9.9 seconds will probably be too slow for a lot of you. If so, your alternative is a turbocharged 1.6-litre THP 165 engine that delivers a bit more oomph, gets you from rest to 62mph in 8.7 seconds, and feels better suited to the automatic ‘box. On the other hand, it costs more to buy, run and tax. For that reason, we’d stick to the PureTech 130, which can return 57.6mpg. Inside, we have no complaints with how luxurious the D4 looks and feels. It’s based on the standard C4 but oozes more class and style, and we love how the instruments light up in different colours. There’s also a few sophisticated trim finishes to get excited about as well as a panoramic windscreen. For this reason, it’s a huge shame that the D4 is saddled with a stiff ride. It’s just not that comfortable to ride in, while petrol noise can be a bit of an issue on the motorway. 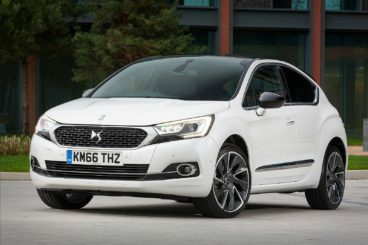 Is the Citroen DS4 Hatchback practical? Not massively. The rear windows protrude which makes manoeuvring tight spaces awkward, while accessing the rear seats is equally tricky. And why oh why did Citroen give the car fixed back windows?! Upfront, the driver and their passenger will have plenty of space and there are plenty of storage areas, too. The boot, meanwhile, measures 385-litres. A front-wheel-drive MPV? Is this even a BMW? It sure is – and it’s a pretty damn fine one at that. It’s not as fun to drive as your usual BMW but it’s an “interesting” alliterative to mainstream MPVs. 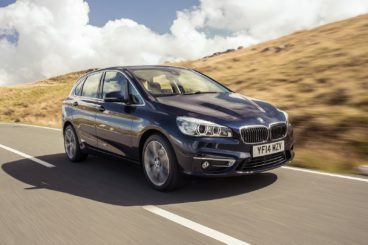 Not quite as practical as those mainstream rivals, the BMW 2 Series Active Tourer is, however, more engaging, more luxurious, better built, stronger and generally more upmarket.